Wisdom of Life. : My two best friends. Would like to introduce two of my best friends to all of you. On the right, i have known him for twelve interesting years. The one on the left has been my buddy for almost 39 years, he has learned to follow all my character and behaviour. Though they are naughty and mischievous at times, both have good heart for everyone. One is my son and the other is my grandson, and i am so proud of them for following my footstep in life. My belief - "A truly rich man is one whose children run into his arms when his hands are empty". Amazing shot! 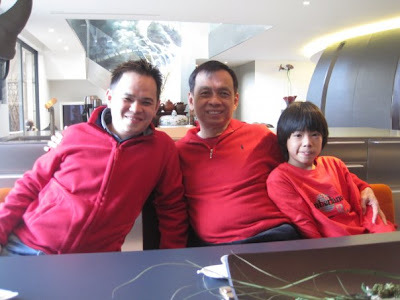 Men in red made up of 3 different generations sharing almost similar genetic characteristics. Dad, thanks to all the good and bad genes. hehe... We are all truly rich in our hearts and souls.